Superstar Rajinikanth’s fans are now in a celebratory mood as they have got to witness the first look poster of Thalaivar 167 at the start of the day! Lyca Productions released Thalaivar 167’s poster with the title and also made an exciting announcement about the release date. Titled Darbar, Thalaivar 167 is an A.R.Murugadoss directorial which will have a Pongal 2020 release. It is also touted to be a police story in which Nayanthara is cast as the female lead. The poster had an impressive tagline. Rajinikanth’s punch dialogues have many times gone viral and has stayed with fans without being bounded by time. His famous dialogues are ‘En Vazhi Thani Vazhi’, ‘Oru thadava sonna 100 thadava sonna mathiri’, ‘Pera ketta udane chumma Adhirudhilla’ and many more. Darbar poster had the following line:’You decide whether you want me to be good, bad, worse’. 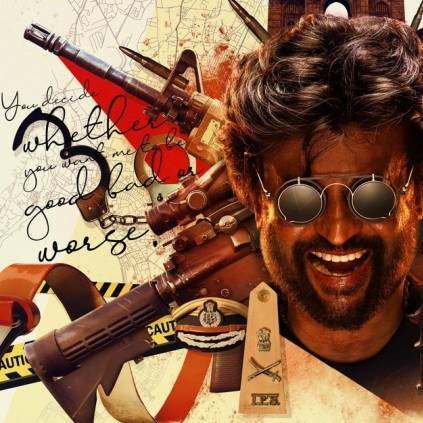 Just like his iconic one-liners, will Darbar’s ‘Good, bad or worse’ become Thalaivar fans’ new popular punch line? The shooting for Darbar is all set to happen in Mumbai from tomorrow and fans are already rejoicing the Pongal arrival of Rajinikanth. Petta which was also released on Pongal of 2019 became a blockbuster. People looking for online information on A. Subashkaran, Anirudh Ravichander, AR Murugadoss, Darbar, Lyca Productions, Nayanthara, Rajinikanth, Thalaivar 167 will find this news story useful.